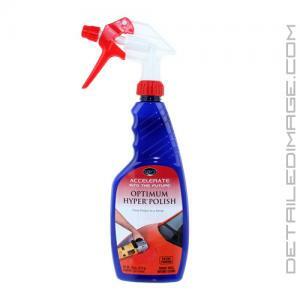 Optimum leads the way again with an innovative new way to polish with Optimum Hyper Spray Polish. That's right you can now spray a polish on and buff your vehicle quicker than ever before by hand or with a buffer. It's the fastest way to remove swirls, oxidation, etc. and restore a brilliant finish. It can be used on all types of clear coats with outstanding results. It's has medium cutting power while finishing down just like a premium light polish. It will remove light wet sanding marks or haze left behind from more aggressive polishes or it can be used by itself with fantastic results. This completely new formula took years of research and testing to perfect with the help from one of the worlds largest car manufacturers. It was designed to get the best results possible in the least amount of time. It utilizes both diminishing abrasives and ultra fine micro-abrasives that will not break down so you have the best of both worlds. This one of a kind formula will impress you from the very first application. To use it simply spray the polish on your pad or directly on your vehicle and begin buffing. When you spray it on your pad it more evenly coats the pad so it's instantly primed and ready to go. You can also do both by misting it on the pad and the paint for best results. Traditional polishes often leave some parts of the pad dry which can more readily cause hazing. Additionally you wind up using less product and saving money because it's being spread more evenly. Best of all during the application you'll notice there is no dusting and it works great in the sun or shade. This means less time is spent on removing the excess polish as well. The convenient spray polish is perfect for professionals and enthusiasts alike so everyone will enjoy improved results in less time. Upon completion the paint will look more optically clear and glossy. Try the Optimum Hyper Polish Spray today and you'll see why a world's leading car manufacturer, professional detailers and enthusiasts alike are loving this product! I have used a lot of polishes since first starting out in detailing, and in my opinion Optimum Hyper Polish is one of the most under rated polishes on the market. I have not found a job that I haven't been able to use this on yet. Don't let the medium cut rating of this versatile polish fool you, it finishes down just as nice as any finishing polishes on the market while removing some pretty major defects. This ground-breaking spray polish is fast cutting, ZERO dusting, and user friendly. The Optimum Hyper Spray Polish contains a unique blend of proprietary polymers and polishing agents that will rapidly remove swirls and minor blemishes while producing brilliant gloss and clarity. 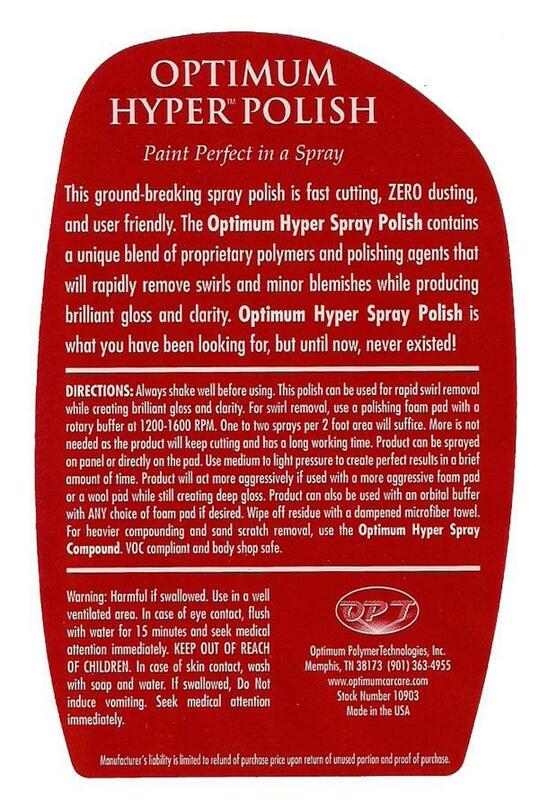 Optimum Hyper Spray Polish is what you have been looking for, but until now, never existed! DIRECTIONS:Always shake well before using. This polish can be used for rapid swirl removal while creating brilliant gloss and clarity. For swirl removal, use a polishing foam pad with a rotary buffer at 1200-1600 RPM. One to two sprays per 2 foot area will suffice. More is not needed as the product will keep cutting and has a long working time. Product can be sprayed on panel or directly on the pad. Use medium to light pressure to crate perfect results in a brief amount of time. Product will act more aggressively if used with a more aggressive foam pad or a wool pad while still creating deep gloss. Product can also be used with an orbital buffer with ANY choice of foam pad if desired. Wipe off residue with a dampened microfiber towel. For heavier compounding and sand scratch removal, use the Optimum Hyper Spray Compound. VOC compliant and body shop safe.